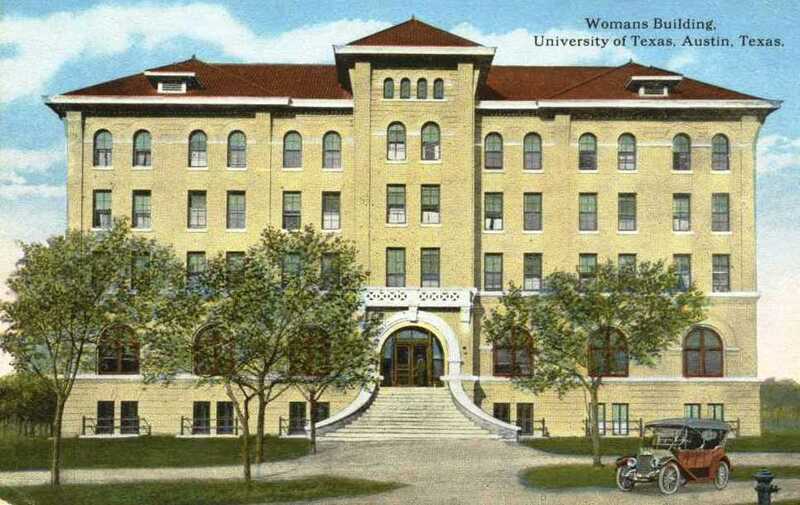 Above: The Woman’s Building, the first UT residence hall for co-eds. It stood where the Flawn Academic Center is today. 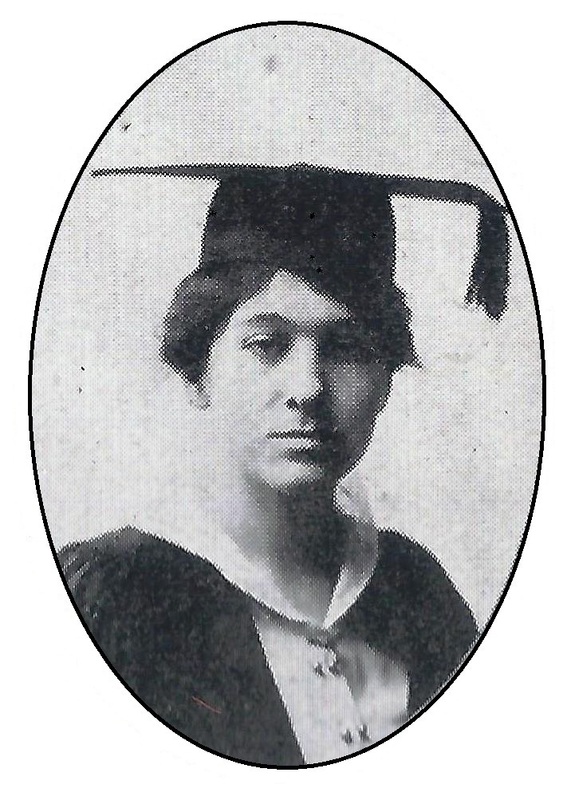 A century ago, the spring of 1915 was an exciting time on the Forty Acres. In February, a group of sophomores kidnapped the freshman class president to prevent him from attending the annual Freshman Ball, though he managed to escape. March was welcomed by an all-out rumble between law and engineering students at the old water tank on the north side of campus. 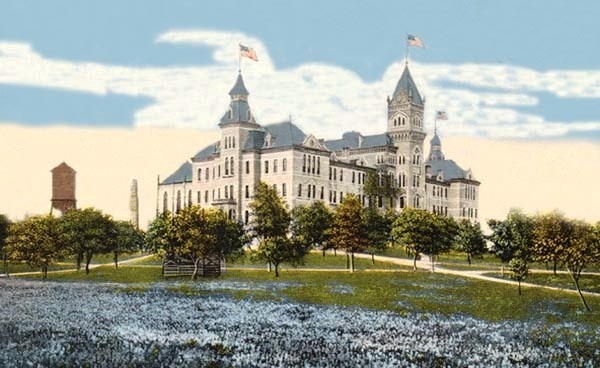 Several professors stayed up all night to safeguard the tank, only to wind up making an incredibly precarious early morning climb up to the roof of the old Main Building to grab a flag hung by some students in the Academic Department. April finally arrived with its annual blanket of Texas Bluebonnets (photo above), but trouble was brewing in the Woman’s Building. 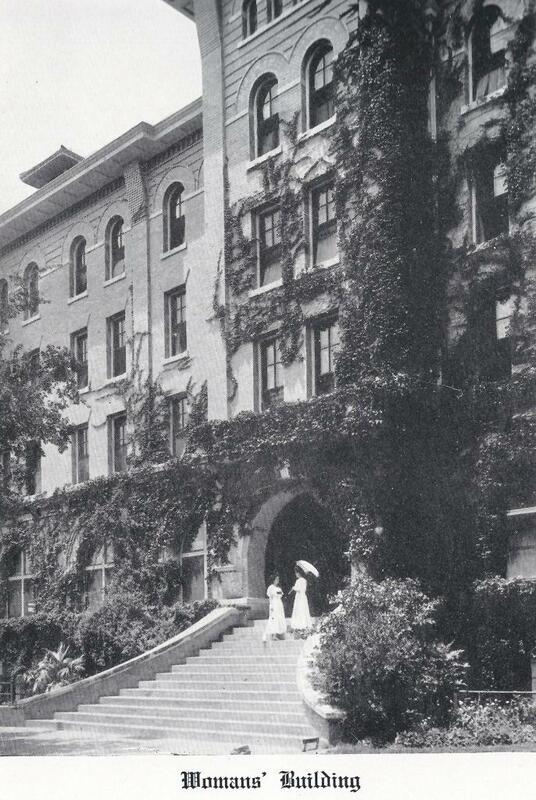 Opened in 1903 as the first UT residence hall for co-eds, the Woman’s Building housed 86 girls, mostly in single rooms, along with head matron Mrs. Carothers. Students enjoyed their own dining room and parlor, and a full gymnasium in the basement, which included a pool, elevated running track, and basketball court. 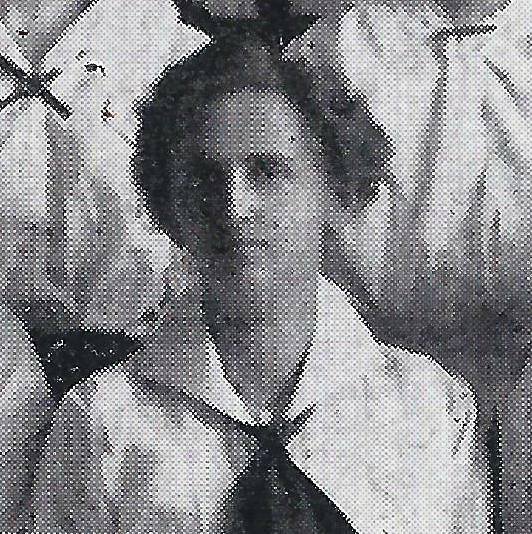 (The first basketball games at UT were played by women.) The girls, though, were only allowed to go out three times a week, had an unwavering 10 p.m. curfew, and needed a chaperon to accompany any dates. neighbors volunteered to help change cold compresses, refill a glass of iced pineapple juice, and offer comforting words, all while studying for mid-term exams. But with a contagion loose in the residence hall, it was only a few days before the inevitable. Anne Aynesworth (below right) was the next casualty. As a precautionary measure, Dr. Gilbert placed her in Seton Hospital, then just northwest of campus on 26th Street, but it was too late. On the first day, more than 30 girls visited Anne, brought flowers, fruit, and news that others had succumbed: “Viola Baker has it – fainted on the stairs.” The next morning, less than half of the group was still healthy. By afternoon, only Pinkie Miller had escaped. Head Matron Mrs. Carothers was ill, along with four of the kitchen staff. Dr. Gilbert reversed course, kept everyone at the Woman’s Building, and turned the hall into a makeshift infirmary. Co-eds who were still well were excused from classes and pressed into service to carry sick trays and smiles upstairs to the fallen. A letter writing committee was organized to notify parents, and each patient was consulted as to which letter they’d like sent to the folks at home. The committee created three types from which to choose: the not-to-worry letters to shield parents from undue anxiety, letters designed to raise a little concern and thus provide a ready excuse for a poor report card at the end of the term, and, lastly, letters calculated to alarm parents just enough that they would send flowers . . . and checks. Sunday evening, April 11th, was one of the few times during the week that men were allowed to visit the Woman’s Building, though with so many girls ill and confined to their rooms, only one gentleman was seen in the parlor. A sophomore, who also happened to be a reporter for The Daily Texan, had called upon his girlfriend. The two were sitting in “Lover’s Nook,” in a corner of the parlor next to the grand piano. A few of the girls spied the reporter and, perhaps giddy from climbing stairs and tending to the sick all day, saw an opportunity to have some fun. They huddled a few minutes to perfect their plans, and then approached the reporter and his date with serious faces. The reporter perked up. His journalistic nose smelled a story. He casually replied that he didn’t think the campus knew too much, but, of course – and let his sentence drift away. “Follicular Ticsiphobia” was a name the girls had invented just moments beforehand. The reporter remained with his date until curfew, and then hurried off to the Texan offices to tell the editor and write his scoop. The prank was a success. The following day, the Texan ran an update that claimed the illness among the co-eds had been checked, and Dr. Gilbert thought it was simply a peculiar form of the flu. “Though the name Follicular Ticsiphobia did not follow Doctor Gilbert’s diagnosis,” the paper explained, “the girls assert it is by no means inappropriate, as it translates into plain English as ‘throat fits’ or something of the sort.” So much for fact checking. That might have been the end of the episode, except that newspapers across the state subscribed to the Texan to keep up with events on the UT campus, and the Texan was mailed daily. Through the rest of the week, several of the state’s dailies saw the story and republished it almost verbatim. If it had happened a century later, Follicular Ticsiphobia would have been trending on Twitter. It wasn’t long before the President’s Office and the Woman’s Building were besieged by telephone calls and Western Union telegrams from harried parents. Would the girls be all right? Had it spread to the men’s dorm? Had the campus been quarantined? Mrs. Carothers, still bedridden, pale, and weak, resolved to answer every telegram, and dictated her reassuring replies in a raspy voice that was barely above a whisper. Within two weeks, the outbreak of tonsillitis, or the flu, or whatever it was, ran its course and disappeared from whence it came. 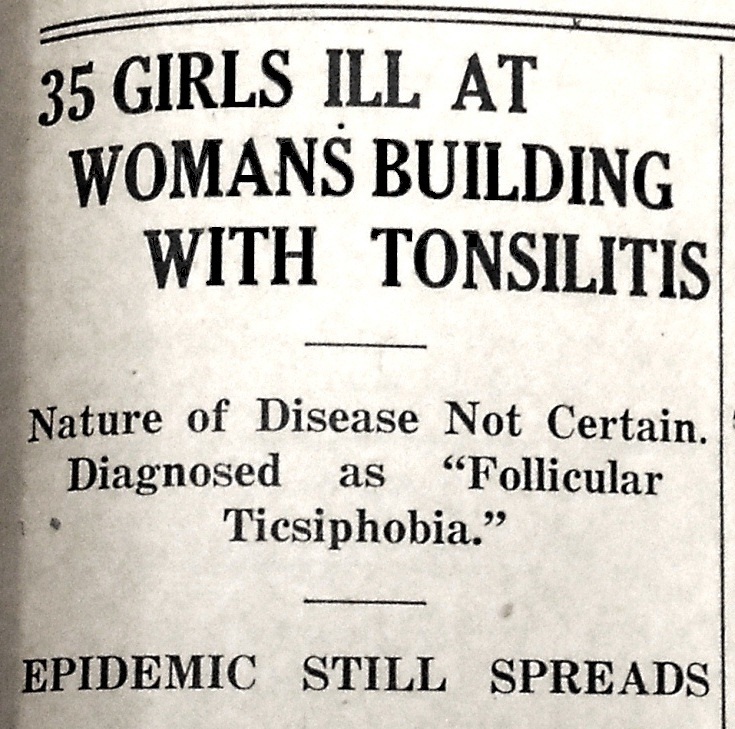 But for years, even the slightest case of an allergy in the Woman’s Building was jokingly declared to be a new outbreak of Follicular Ticsiphobia. 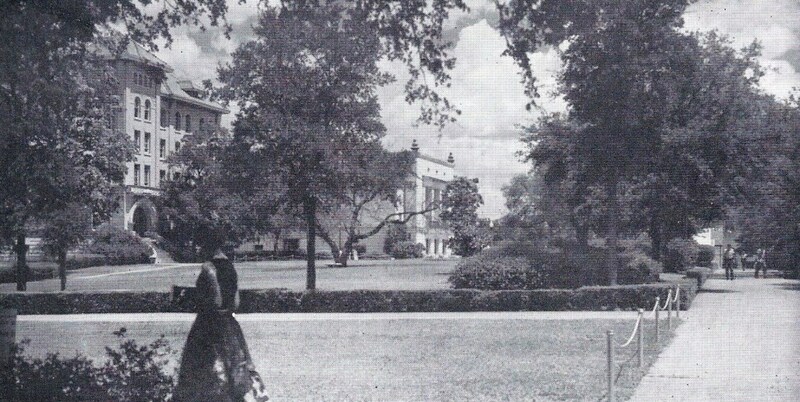 Above: In the 1950s, the old Woman’s Building (left) could be seen from the West Mall, standing next to Hogg Auditorium. The building burned in 1958, and was replaced in the 1960s by today’s Flawn Academic Center. The sidewalk on the right now passes along and under the east side of the FAC. Click on the image for a closer view. This entry was posted in Uncategorized and tagged Carothers, Daily Texan, Follicular Ticsiphobia, Jim Nicar, Woman's Building by jimnicar. Bookmark the permalink.